Take Tokyo in your stride by getting outside and going for a run around some popular Tokyo running routes. Why go running in Tokyo? 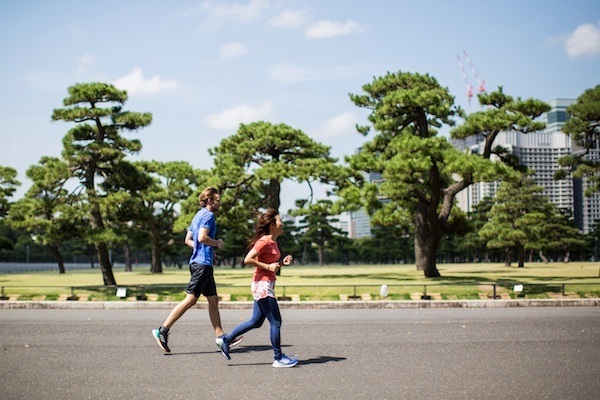 Tokyoites love to get out to hit the top running routes around the capital's rivers and parks – join a running club or jog along some of the city's famous routes to really connect to the city in a whole new way. If you're visiting Tokyo for sightseeing, chances are you'll be dining out on your fave Japanese food! Don't forget to stay on top of your game – Tokyo's great access, clean streets and friendly locals make it welcoming to runners. Many of Tokyo's popular running routes take in all the city's attractions, from the Imperial Palace to Tokyo Tower. See these popular sightseeing spots from a new angle, away from the crowded touristy areas. Train for the big one! Why not set a goal to run the Tokyo Marathon? Held annually each February, the country's top race attracts applications from all over and is suitable for all – including those just jetting in for travel. Runbase Tokyo, by adidas, is a running station providing the perfect place from which to start your run. They provide changing facilities, over 150 rental lockers and 16 shower cubicles – those who are 'running' light can even borrow state-of-the-art adidas clothing and custom-fit shoes – and even buy them if they like. Runbase Tokyo is based in the heart of Tokyo in the Nagatacho district, just 1 minute from Nagatacho station (Hanzomon, Namboku and Yurakucho Tokyo Metro lines). It's on the doorstep of the Imperial Palace loop running route – a great running course suited to all levels!